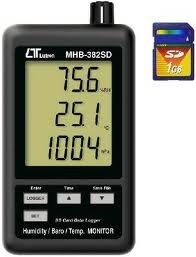 Recorder with real time recorder, save the measuring data along the time information ( year, month, date, minute, second) into the SD memory card and can be download to the Excel, extra software is no need. Humidity : 10 to 90 % RH. Temperature : 0 to 50.0 oC, oC/ oF. 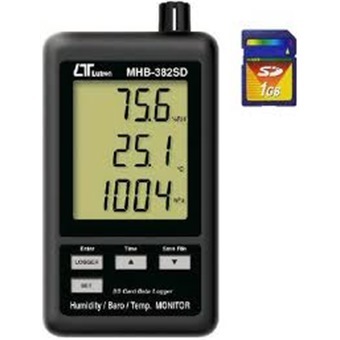 Show barometer, humidity and temperature value in the same LCD. DC 1.5V ( UM-4, AAA) battery x 6 PCs or DC 9V adapter in. Size : 132 x 80 x 32 m.